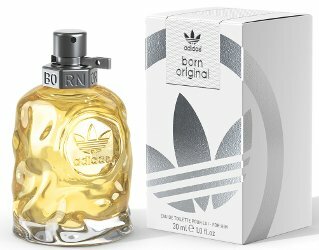 Adidas has launched Born Original, a new duo of fragrances "that ignite the creative talent within". Born Original for Her ~ "Born Original for Her begins with a bright citrusy cocktail of bergamot, apricot and orange zest. The top notes burst into a vibrant, sweet candy apple accord and tantalizing notes of exotic coconut, jasmine and tonka beans add an unexpected twist for an intoxicating finish." In 30, 50 and 75 ml Eau de Parfum. 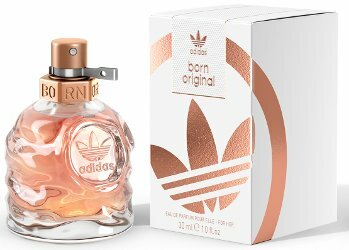 Born Original for Him ~ "Born Original for Him is a classic oriental remixed with an addictive ambery citrus accord. A fusion of violet leaves and rhubarb adds a green lyrical facet, which is contrasted with spicy black pepper and orange oil." In 30, 50 and 75 ml Eau de Toilette. That is a seriously ugly bottle, and the notes sound like the kind of fragrance that would attract bees. No thanks. The shape of the women’s version reminds me of a curvier/less angular Pleats Please. The color of the juice underscores the comparison of the appearance. The association with sneakers just causes an automatic “No thanks!” response in me.